AMENABILITY TO EXON 51 SKIPPING. 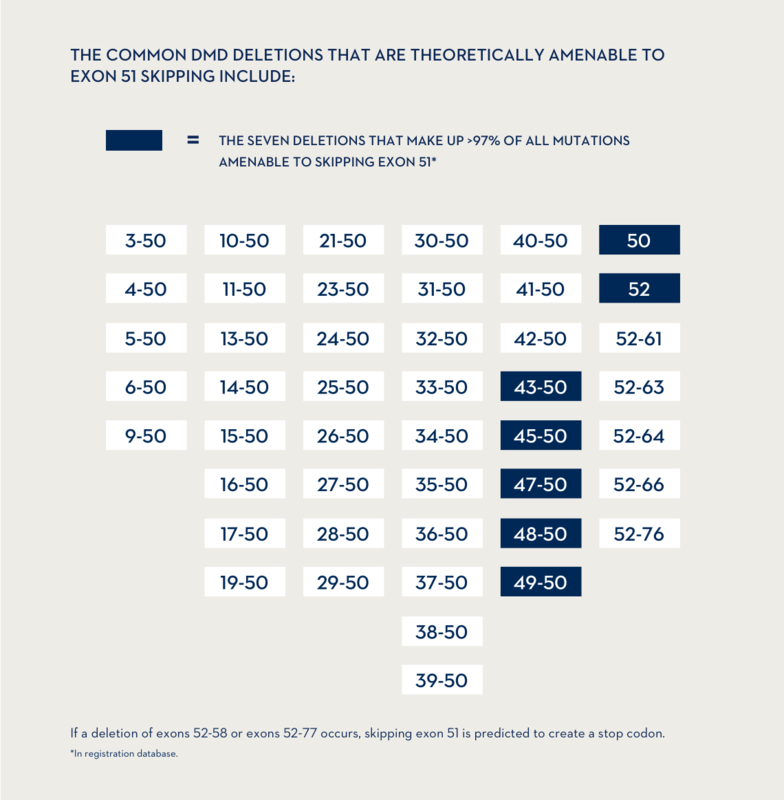 To determine whether EXONDYS 51 therapy is appropriate for your patient, assess genetic test results to see if their mutation is amenable to exon 51 skipping. 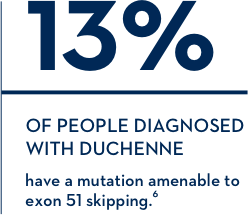 For exon skipping to work, exon 51 must be present in the patient's DMD gene. den Dunnen JT. Leiden Muscular Dystrophy pages. Leiden, Netherlands: Center for Human and Clinical Genetics, Leiden University Medical Center; 2003. Available at dmd.nl. Accessed June 1, 2018. Fletcher S, Adams AM, Johnsen RD, et al. Mol. Ther. 2010;18(6): 1218-1223. Aartsma-Rus A, et al. Theoretic applicability of anitsense-mediated exon skipping for Duchenne muscular dystrophy mutations. Human Mutation. 2009;X:1-7.